Liliane Tomasko has exhibited widely in museums and galleries across the US and Europe, and is represented in important collections worldwide. Her current exhibit at ROCA represents Tomasko’s first in Rockland County since moving her main working studio to Tappan in 2015. The acclaimed artist will offer a rare glimpse into the philosophical reverie that underpins all of her work. Tomasko says she finds inspiration in the mystery of the most mundane artifacts of domestic life: piled up bags, folded bedlinens, a dress on a hanger. One particular series of paintings, from 1999-2000, of empty beds with crumpled sheets, became central to the artist’s current direction. In 2014-15 Tomasko made a series of photographs, recording the human imprints left on the bedsheets after a night’s sleep. Like a fingerprint of a night they are a record of a life in the tossing and turning, the involuntary motions of dream. This inspiration was then further honed down to a series of line drawings that use the wrinkles of a night’s sleep as the starting point for Tomasko’s painting from 2015 to date. This exhibition of new work sees Tomasko honing that concept still further, using a collection of folded and stacked hotel bedlinens. 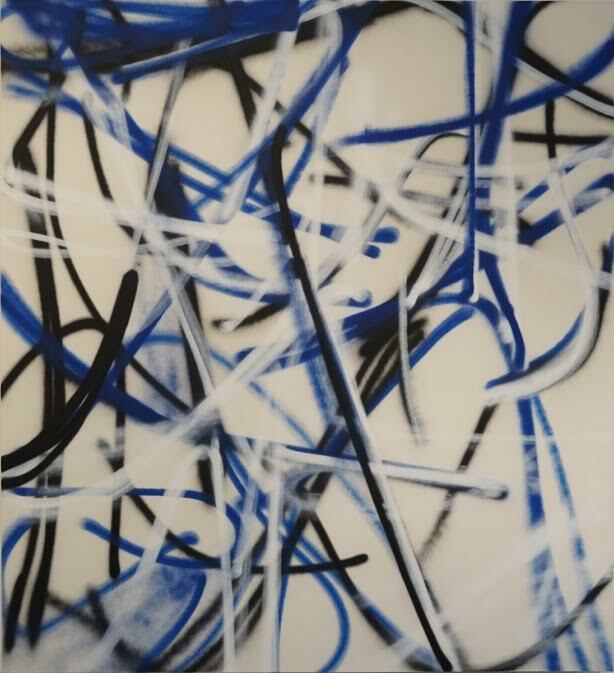 Each measuring 109 x 65 inch, the scale of a twin bed, the sheets are now unfolded and drawn on with bravura strokes of spray paint, then hung with their irregular and individual grids of folds still visibly present. Semi-transparent black is contrasted with carbon black, white against the off-white fabric, and blue, create a near monochrome nightscape. “12 nights x dreams” exhibit will be on view through March 11, 2018. Rockland Center for the Arts is located at 27 S. Greenbush Rd., West Nyack, NY 10994. Regular hours are: Mon-Fri 10-4; Sat 1-4, and Sun 1-4 pm. For more information go to www.rocklandartcenter.org or call 845-358-0877.